Dubai lies directly within the Arabian Desert. 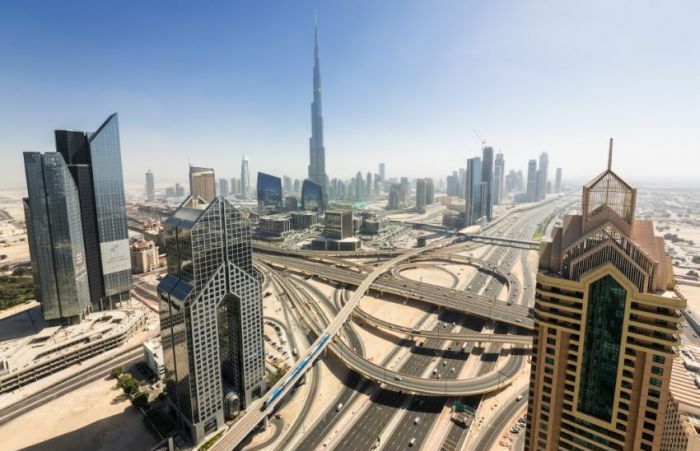 However, the topography of Dubai is significantly different from that of the southern portion of the UAE in that much of Dubai's landscape is highlighted by sandy desert patterns, while gravel deserts dominate much of the southern region of the country. The sand consists mostly of crushed shell and coral and is fine, clean and white. East of the city, the salt-crusted coastal plains, known as sabkha, give way to a north-south running line of dunes. Farther east, the dunes grow larger and are tinged red with iron oxide. The flat sandy desert gives way to the Western Hajar Mountains, which run alongside Dubai's border with Oman at Hatta. The Western Hajar chain has an arid, jagged and shattered landscape, whose mountains rise to about 1,300 meters in some places. Dubai has no natural river bodies or oases; however, Dubai does have a natural inlet, Dubai Creek, which has been dredged to make it deep enough for large vessels to pass through. Dubai also has multiple gorges and waterholes which dot the base of the Western Al Hajar mountains. A vast sea of sand dunes covers much of southern Dubai, and eventually leads into the desert known as The Empty Quarter. Seismically, Dubai is in a very stable zone—the nearest seismic fault line, the Zagros Fault, is 200 km (124.27 mi) from the UAE and is unlikely to have any seismic impact on Dubai. Experts also predict that the possibility of a tsunami in the region is minimal because the Persian Gulf waters are not deep enough to trigger a tsunami. The sandy desert surrounding the city supports wild grasses and occasional date palms. Desert hyacinths grow in the sabkha plains east of the city, while acacia and ghaf trees grow in the flat plains within the proximity of the Western Al Hajar mountains. Several indigenous trees such as the date palm and neem as well as imported trees like the eucalypts grow in Dubai's natural parks. The houbara bustard, striped hyena, caracal, desert fox, falcon and Arabian oryx are common in Dubai's desert. Dubai is on the migration path between Europe, Asia and Africa, and more than 320 migratory bird species pass through the emirate in spring and autumn. The waters of Dubai are home to more than 300 species of fish, including the hammour. The typical marine life off the Dubai coast includes tropical Fish, jellyfish, coral, dugong, dolphins, whales and sharks. Various types of turtles can also be found in the area including the Hawksbill turtle and Green Turtle which are listed as endangered species.